It was in the year 1909. The place was Salisbury, a large town of South Africa. It was then ruled by the Britishers. But the rulers were sworn racists. They considered nonwhite persons as brutes and behaved with them accordingly. The natives of the country were deprived of many legitimate rights. At that time, an Englishman, who was then the collector of Salisbury, ordered arbitrarily that no black person can drive a bullock-cart on the main roads of the town. Daily he used to find for himself it his order on a horse and hold a whip in his hand. In case he found any black person driving his cart on the main road he used to lash him mercilessly. One day, the collector saw a non-European driving a bullock cart in front of his residence. he got furious, rushed with his whip and lashed the driver for several minutes. But to his surprise the driver neither got afraid nor uttered any sound of pain. Instead, when he stopped lashing the driver asked him in chaste English-“Is it enough, “Are you now satisfied?” This took the Collector aback. Being surprised the Collector asked, “Who are you?” The reply was “I am a Barrister Named Mohandas Karamchand Gandhi.” The Collector was ashamed at heart and from that day gave up this barbaric habit. 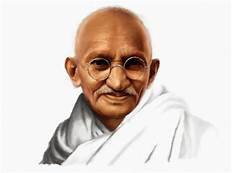 this exceptional capacity of tolerance, firm faith in non-violence and the capacity to change the heart of the wrong-doer, earned the titles of “Mahatma” for him by his countrymen, the Indians. Till today he is regarded as the greatest mass leader and the father of our nation for which he is often called “Bapuji” which means father. 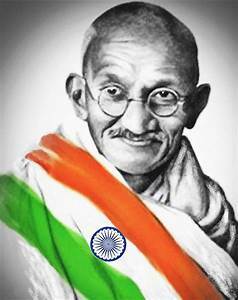 Gandhiji was born on 2nd October 1869 at Porbandar, a small town of Gujarat. His father Kaba Gandhi was the Diwan of Porbandar and his mother Putli Bai was a very pious lady. Gandhi’s character was much influenced by the religiousness of his mother. During his stay at South Africa Gandhiji was influenced by the writing of the immortal litterateur Leo Tolstoy, who was a grate exponent of truth and non-violence. So Gandhiji wanted to serve his motherland by such means and came back to India 1914. That year First World war started. The Britishers Promised Dominion Status for India after the world war was over. Gandhiji believed them and helped them as much as he could in that war. But at the end of war in 1919 the victorious British Government took a different attitude and evoded fulfillment of their earlier assurance under vague pleas. This was a great shock for a truth-loving person like Gandhi. He lost all faith in them and determined to make India free by non-violent method. At that time, the Indian National Congress was struggling for freedom of India under the leadership of Balgangadhar Tilak. Tilak expired by end of 1919. Since then Gandhi took up the leadership of Congress to utilize as a platform for earning freedom by non-violence and non-co-operation. Since then, till his martyrdom in 1948, Gandhiji was the supreme leader of the Congress. Even members of political parties who did not believe that freedom could be achieved by non-violence and non-co-operation, had deep regard for Gandhiji and used to come to him for advice. Apart from truth and non-violence, Gandhiji was very keen for communal harmony in India. Though the Partition of India pained him most, he had to agree to it for the stubbornness of Jinnah. Gandhiji desired Hindus and Muslims should stay together like brothers. He disliked the untouchability problem, wrote and spoke a lot against it, and named the so-called untouchables as “Harijan” which means the own people of God. His attempt for Hindu-Muslim unity and his acceptance of certain illegal demands of Pakistan, enraged a group of communalist Hindus. They wanted to get rid of him. So, while Gandhiji was coming to attend his daily prayer meeting at Delhi, a person named Nathuram Gadse suddenly came forward and shot him thrice. Gandhi fell down uttering “O Ram” and died on the spot. thus he became a martyr like Christ or Buddha. The whole world was shocked to hear the news. All Countries paid high tributes to Gandhiji. Though so many years have passed, yet Gandhiji alone is till the source of inspiration for Indians.